While nearly half of all adults snore occasionally, snoring is not quite so common in children. So if your kids snores, is that cause for concern? Q: What might cause a child to snore? A: The most typical cause of snoring in children has to do with excess, or obstructive, tissue in the throat. “In children, large tonsils and adenoids are often a source of bulky tissue in the throat and the snoring that results,” Dr. Hopkins says. Q: When is snoring a cause for concern? Your child snores most nights of the week. You frequently hear snoring during the night. The snoring is very noisy. Your child routinely sleeps with his or her mouth open, and chin or neck extended. You hear your child pause or gasp while sleeping. “Sleep apnea can lead to daytime fatigue and poor daytime performance, creating concentration or attention issues,” says Dr. Hopkins. 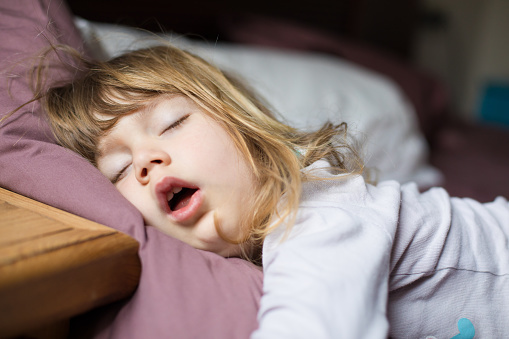 Q: Are some children more prone to snoring? Q: What information does your pediatrician need to make a diagnosis? A: Before your child’s visit to the doctor, start a sleep journal. Observe and record your child’s sleep habits, starting about one hour after he or she goes to bed. “Track how many nights of the week the snoring occurs and whether it happens frequently, or only occasionally, during the night,” Dr. Hopkins advises. And watch for the five red flags above, he says. Q: What types of treatment are available? A: The goal is to restore restful sleep to your child, says Dr. Hopkins. When snoring prevents this, several treatment options are available. If the problem is large tonsils or adenoids, your doctor may recommend surgery to remove them. If excess weight is an issue, you can work with your pediatrician to help your child lose some weight. When the underlying problem is sleep apnea, your doctor may suggest weight loss — or possibly surgery. Once sleep apnea resolves, 90 percent of otherwise healthy children have no further issues, notes Dr. Hopkins.